On a recent visit to my local farmers market, I scored fresh Brussels sprouts on the stalk. They are so delicious, and the greens so tender, so I thought, why not use them in a vegetable soup? I also had a fresh rutabaga, carrots, celery and onions, so I set out to make this soup. 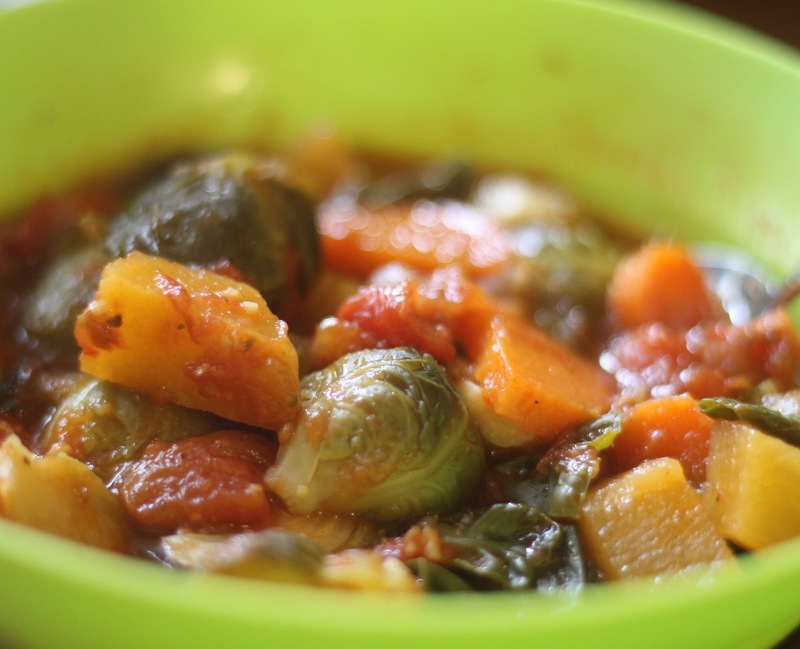 I used the greens from the Brussels sprouts, but you can use any greens you want, even chopped cabbage would work. 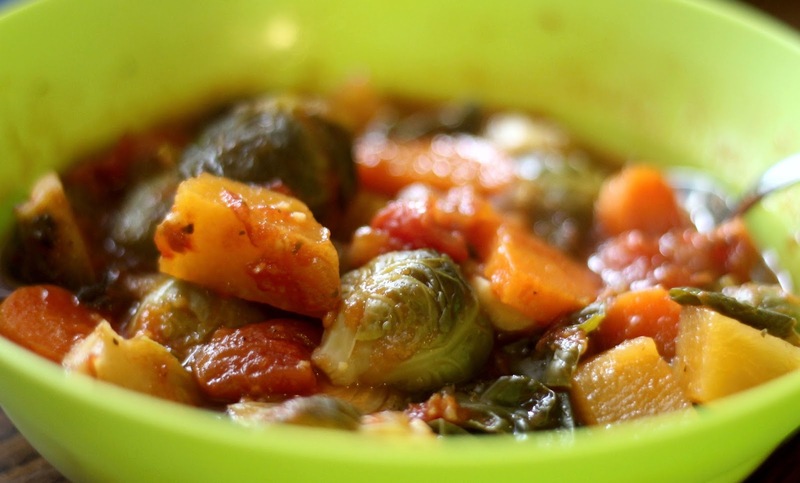 The beauty of this recipe is you can use almost any vegetable you want. The base to the soup is simple, so play around and use any of your favorites in this nourishing soup. Use vegetable stock to keep it vegetarian, or add your favorite turkey or chicken bone broth. Talk about fresh and delicious, it is so good you won't even miss the meat. Place tomato sauce, petite diced tomatoes, stock/broth, celery, dried onion flakes, minced garlic, oregano, Italian seasoning, salt and pepper in a large sauce pan. 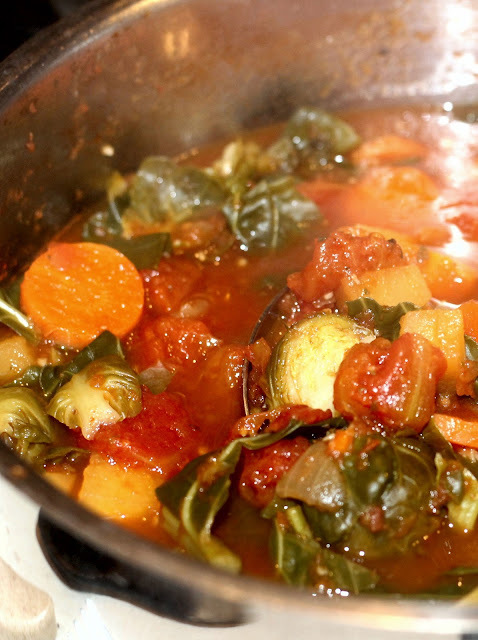 Bring to a boil over high heat; reduce heat to low and simmer covered about 20 minutes. Add carrots and rutabaga and cook until almost tender, stirring occasionally. Stir in Brussels sprouts and greens and cook until tender. Serve hot over rice or soup noodles, if desired.